The Old Testament book, the SONG of Solomon, was written by King Solomon as a declaration of his undying LOVE for his beloved. But this is, in God’s plan, actually a picture of Christ’s SONG of LOVE for His beloved, the Church, which is the Body of Christ. 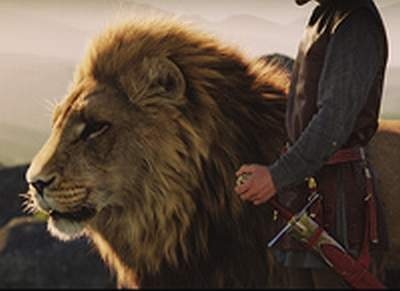 In the Chronicles of Narnia, Aslan is the picture of Jesus, the Lion of the Tribe of Judah … & the humans He leads into His land of Narnia, are a picture of His Church. the Body & Bride of Christ. as it has been to each of us. from a Biblical perspective, why we ARE different in the way we function. BEFORE we began to meet as functioning members of a Body. to BE the Church & HAVE fellowship. EACH of these studies before joining with us when we meet. You will be very thankful that you did so. it helpful to look over the Spiritual Gifts definitions & survey. !! !AS EACH PART DOES ITS WORK!!! # 1 What is the Body's work? # 6 - 1 Cor 14. We were given gifts to benefit the BODY! Discover your own Spiritual gifts! This link will take you to a STERLING example of a Body of Believers! Quality is poor but it's worth listening to!!! How often are you encouraged??? Hey dad, can I have $20??? from our Alsan's Song Body!!! Jumping over the Grand Canyon!!! for taking praise that is intended to be GODS alone! Do you praise God IN the storm..
God isn't finished with us yet!!! What an incredible story of God's healing power! What an awesome game of basketball!